Training for the most widely used product in this branch is at the highest level. Translation desktops, tools for terminology management and QA checking are used by an increasing number of translators. SDL Trados Certification Training gives you knowledge to use them to their full potential. Every SDL Trados Certified translator receives a certification logo to introduce themselves to new clients. They also receive a personal webpage with all contacts details and areas of specialization. Translators all over the world recognize the SDL Trados Certified Certificate as a key advantage for increasing their competitiveness. Being SDL Trados certified tells the clients you are fully prepared to work with the leading translation technology. 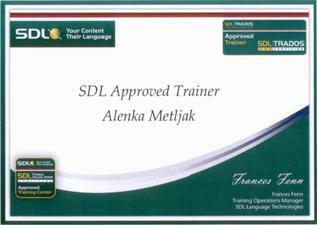 Alenka Metljak is SDL Approved Trainer for SDL Trados Studio 2011 and Multiterm 2011 since November 10th, 2011. 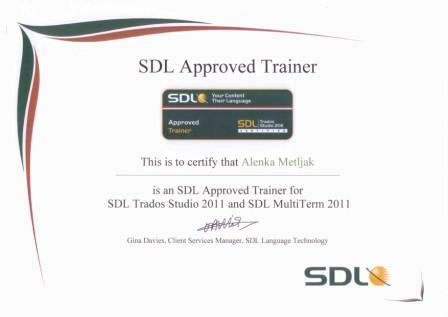 Alt plus employee Alenka Metljak is SDL Trados Approved Trainer for SDL Trados Studio 2009 since February 25th, 2010.